I've ordered it, but not turned up yet. Oh I got it. And I loved it. Great start, great references. So glad its back. Me too. I enjoyed this a lot, especially the references to British superheroes. Out already - better try to remember to look for it tomorrow! Picked up number one of six, all good stuff and the feeling that all the loose end getting pulled together. Can't say I recognize half of it, but I still liked it. A charming read. Really feels like Moore is set on finishing up the story. Yeah, enjoyed it. Like the way it immediately ties directly into Black Dossier, the Nemo books and of course Century, comic and text pieces both. No messing around here, Moore's heading straight for the finish line. The Baxendale piece was good too, can't believe I didn't know he'd stopped working for the Beano before I ever read it, always assumed it was his stuff I'd started on. That's quite a read - though too hot for me to stand up and fetch the comic itself from the next room! Have to re-read the page again when I have issue in front of me. So many Legion of Super-Hero references packed into page 2. When I started work for DCT in the 90s, his name was spoken only in hushed tones. I remember one editorial veteran saying to me: "He left under a cloud." Check out the cover for issue 6. Did Kevin O’Neill design that logo? Not sure what’s going on in this series, but it’s a lot of fun: Moore and O’Neill going crazy with a mash-up of just about any comic style you can think of. Plus, turns out Purdey and Patsy were the same person. Best League book for a long time. And issue 4 has a single-panel appearance by Nemesis the Warlock! Wow! That is super cool, almost... ironic? poetic? 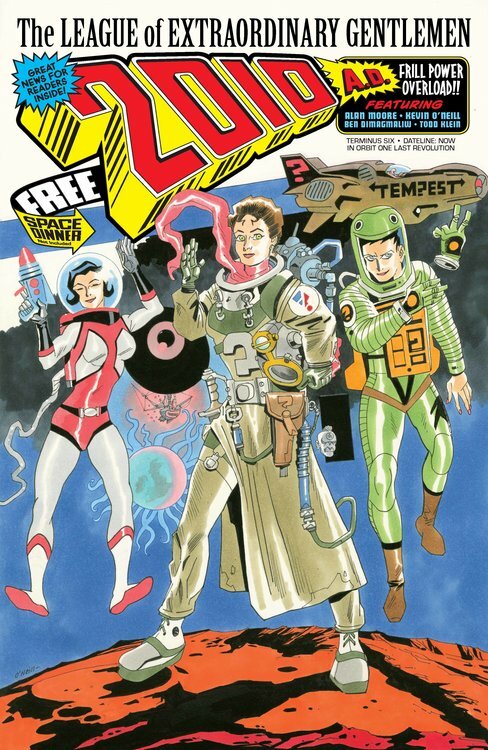 that it’s the final League issue and it’s got 2000 AD theming for its cover design.